A dead cell with exactly three live neighbors becomes live. A live cell with exactly one live neighbor becomes dead. A live cell with more than three live neighbors becomes dead. Our plan is to 1) Generate a random board and 2) Make the random life live and die according to the rules. I split creating the board into 3 steps. The first was to generate these “cells” that contained information like their location (x & y coordinates), their state and their future state (explained below). Second was to “draw” these cells to the board using their information. 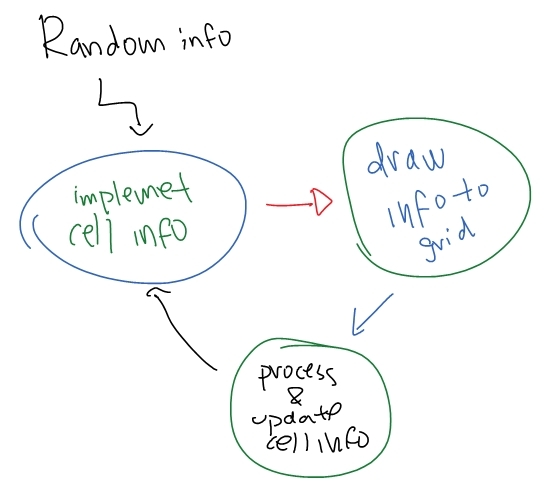 Lastly, the program would “count” the neighbors and update the information by going back to step 1 to “update” cell information and to step 2 to “draw” these steps out on the grid. The idea is to draw these points on the grid, then under certain conditions chnage its state. It may sound simple at first, but the fact that we cannot change the state right away may make this program more confusing than it sounds. The plan I came up with is to, after creating a new class, to add a new parameter & instance variable. If we have it stored in the “next state” value, and made that separate from our “current state” value, the grid wouldn’t change and the actions would be accurate! First of all, I must create a board. 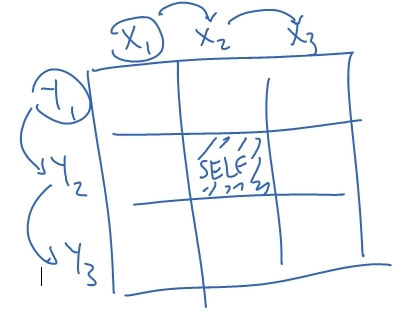 This world is going to be a 2D grid, so I’ll be using a 2D array for that. Also, I would like the draw the points. We will get into drawing the points in the next section, but lets just pretend the drawLife function can draw life with parameters of drawLife(posX, posY, currentState). Creating a random board and drawing points both use double forloops, for we are placing values in a 2D array. The randBool function will be explained in the next section. OH! Forgot to mention. We only want this happening once, so we must put all of this within a if statement that only runs once. A dead cell with exactly 3 live neighbors becomes live. A live cell with exactly 1 live neighbor becomes dead. .3 A live cell with more than 3 live neighbors becomes dead. if (currentState == true && (neighbors == 1 || neighbors > 3) -> nextState = false Remember, we don’t want to intefere with the current grid, which is why we change the values of the next state. We then set all the values current values to the next values (after it’s all processed), and draw the life again. I just created a function with x, y, state (alive or not) parameters to determine where to draw the life cell. I had a videoScale variable, which determined how “big” each cell was. If it was alive, I would fill in white (255), if not, I would fill in black (0). No matter the circumstance, I would still draw a border around each cell. I didn’t want to restart the program everytime I wanted a new world with random values. I added a keyPress checker, if the user pressed “R”, then the board would reset (or start = true again and run it once more)! Because of our video scale of 10 and 50 columns & rows, the size of the window has to be 500x500 (50*10 = 500). Set the background to black and frameRate to 15. Increasing the frameRate would increase the speed of the simulation. I found 15 to be a good speed to view the simulation. We’re DONE! Click here for the online demo. Links to download all the files have two options, Processing + Executable or just the Zipped .Pde file. Copy the full code for the lazy. Please leave your questions or feedback below! What do you think about the Game of Life?